Known for his quick wit and willingness to listen, Dan Ferritor has been a stalwart of the University of Arkansas campus since 1967. His 11 years as chancellor laid the foundation for the university’s continued progress into the 21st century. Among Ferritor’s crowning achievements is the leadership he provided during the renovation of Old Main, a fixture of the Fayetteville skyline and the symbol of the University of Arkansas and higher education in Arkansas. More than $13 million was collected in private and state funding for renovation efforts, and in 1991, the building was rededicated for use by future generations of students. Ferritor’s influence is also seen in numerous aspects of the university campus. During his tenure, he engineered a $120 million building boom on campus that resulted in an additional 2 million square feet of classroom, laboratory and library space. Academic standards for admission were also increased, a move that spurred increased enrollment. Aside from the Old Main fundraising effort, the university also embarked on its first institutional development campaign under Ferritor, increasing annual giving from $3 million a year to $20 million. After stepping down as chancellor in 1998, Ferritor returned to the department of sociology to teach and to guide creation and organization of the Family and Community Institute. In recognition of his commitment to education, Ferritor was awarded the University of Arkansas Alumni Association’s Faculty Achievement Award for Teaching and Research in 1984. Ferritor was also awarded the Chancellor’s Medal in 2000. In March 2001, the University of Arkansas dedicated the Daniel E. Ferritor Hall, named in honor of a chancellor who became known by many as one of the university’s best advocates. 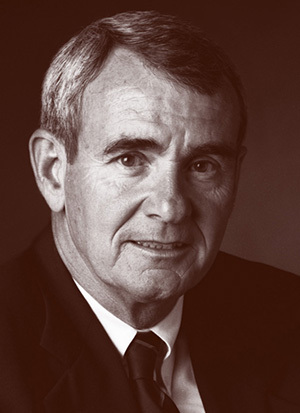 After retiring as a faculty member, Ferritor continued to serve higher education as vice president of academic affairs for the University of Arkansas System. During the latter half of 2015, he returned to the Fayetteville campus to serve as interim chancellor while a search was conducted for the university's sixth chancellor. Ferritor holds a bachelor’s degree from Rockhurst College and master’s and doctoral degrees from Washington University. Personal: Ferritor was born at Kansas City, Mo., on Nov. 8, 1939. He married Patricia Jean Hoey of Kansas City in 1962, and they have three children.